Summer is singing on it’s last verse. If you feel that you haven’t seen much activity from us this season, we hope to come to terms with that before it’s over. We have a few articles coming up and in a month from now we will be celebrating all hunters patron saint Eustace, just like last year. 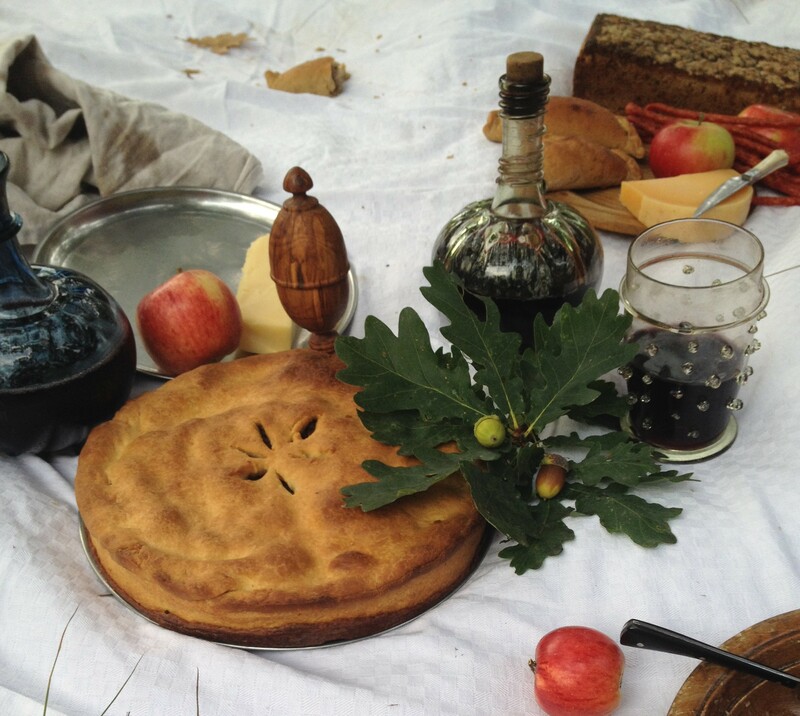 On his feast day the 20th September we invite our friends to a hunters picnic with fun and games in a medieval setting. The concept of our St Eustace celebration is basicly the same as last year (more about that here). We will be having a feast for hunters outside, resembling “The gathering of the hunters” before a Great Hunt. The Great Hunt was a big affair. To me it seems to have been highly regarded both as a sport and social event. It is this kind of hunt that most of the period huntbooks are concerned with. Many people and dogs were involved in a Great Hunt, so it had to be prepared the day before, if not several days ahead. “The gathering of the hunters” takes place where the hunters meet to coordinate and do the final preparatory work before the actual chase. […] And also they that come from home should bring thither all that they need, every one in his office, well and plenteously, and should lay broad clothes all about upon the green grass, and set divers meats upon a great platters after the lord’s power. Now, this was what we want! People eating, drinking and having fun! Encouraging others to get out, use their gear and have some fun is always on the agenda for us. 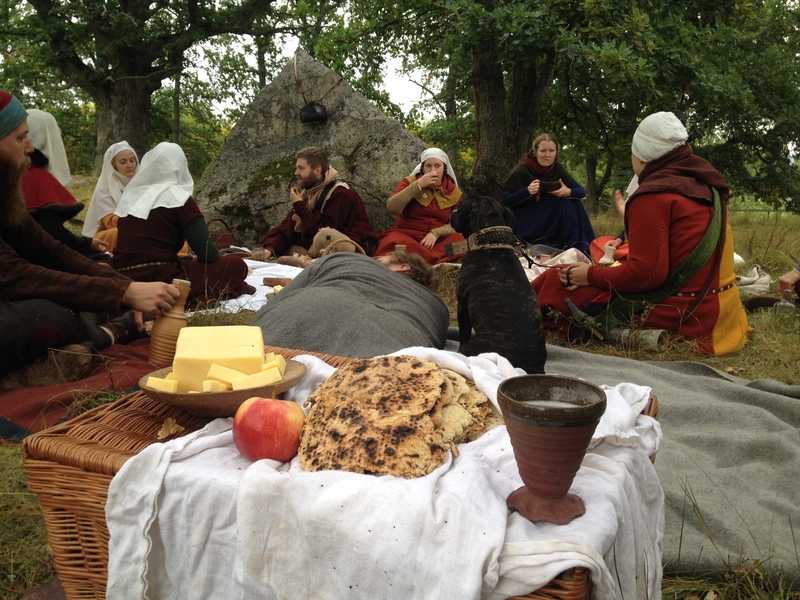 If you read our blog because you are in to medieval clothes or crafts but new to reenachtment and living history, our hunting picnic is a good place to start. It will probably never be quite this uncomplicated again: Instead of a crowd with curious tourists there will be other reenactors welcoming any novice. There will be no need to bring lots of heavy gear, no sleeping outdoors, no walking for miles in thin leather shoes. No fighting or actual hunting will happen, so no weapons needed. And weather is hopefully kind on us, at the least no snow expected this time of year. In other words – if you don’t know us to well but still read this, you are extra welcome! 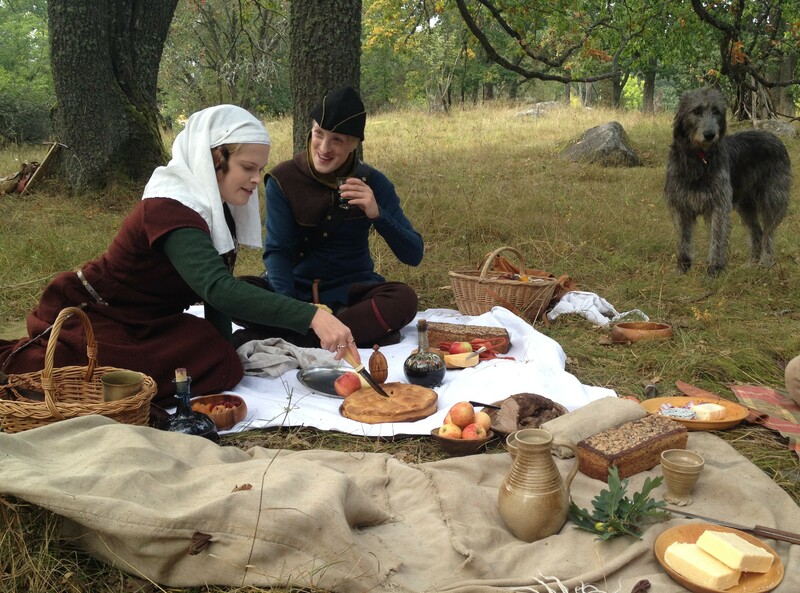 An important ingredient of reenactment besides eating, drinking and having fun is the element of education. Learning new things about the subject at hand for reenactment, or sometimes passing your knowledge on to others. 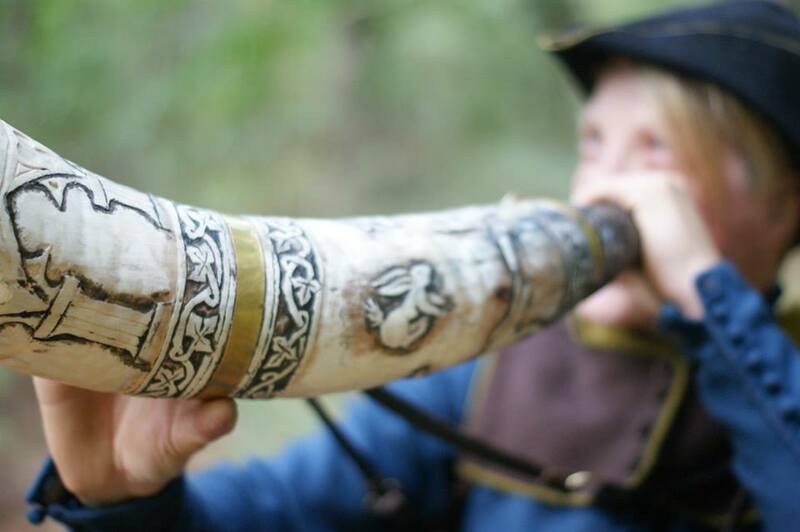 This is why we will be presenting our Hunting Games, a playful competition where knowledge about the medieval hunt is rewarded and hopefully also conveyed. 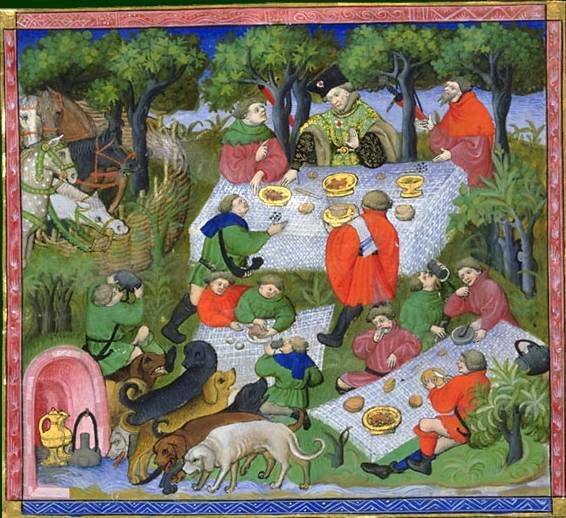 The competitors of last years Hunting Games was put to many a test as we in accordance with the medieval huntbooks sent them of in search of “fumes”, fresh dung from animals in the area who might be interesting to hunt (more about that here). 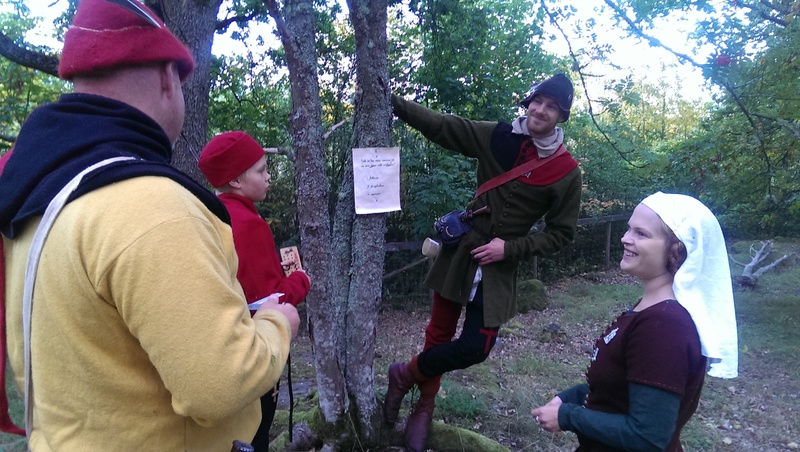 We also had them do a simple quiz on medieval hunting and divided into teams debate the question “Why do we hunt?”. The best use of classic rhetoric and medieval reasoning was deemed as a winner. For grand finale, the best of the best was set to challenge each other in sounding the hunters horn. But I must not reveal to much of our plans for this years celebration. So without further ado – I welcome you to celebrate the feast day of St Eustace, all hunters patron saint! For further information, please check the Facebook-page for the event.